JERUSALEM (CNS) — Franciscans serving in the Holy Land have had an impact on Christian pilgrims, said Franciscan Father Michael Perry, minister general of the order. “The Franciscans’ care for pilgrims, their attention to detail, their efforts to demonstrate the love of God, the mercy of God through different religious services and … how they welcome people in hospitality houses, these become elements that people themselves, Christians and others, take back to (their) countries,” said Father Perry. 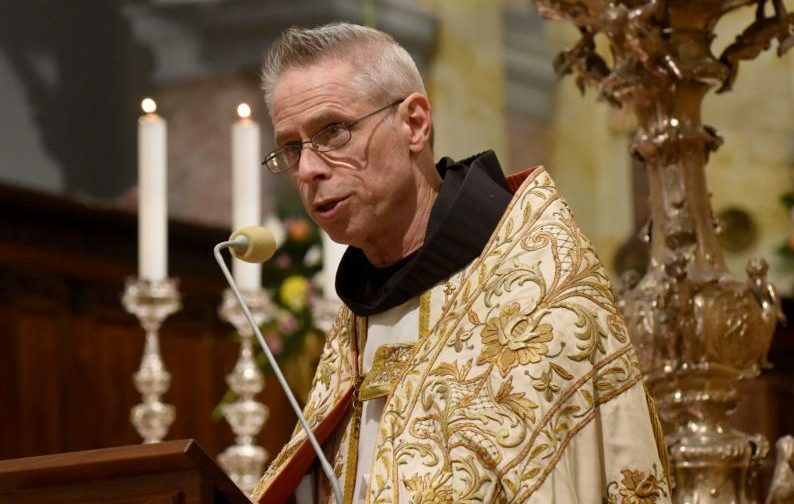 Father Perry spoke to Catholic News Service in Jerusalem during official celebrations of the 800th anniversary of the presence of the Franciscans in the Holy Land. The celebration included three days of prayer, reflections, music and conference meetings, which discussed the history and archaeology of the Franciscans in the Holy Land. Cardinal Leonardo Sandri, head of the Vatican Congregation for Eastern Churches, was among those who attended. In his missionary service, Father Perry said, he has seen pilgrims from many countries talk of the gratitude they felt for the way the Franciscans welcomed them and guided them, offering them an opportunity to meet Jesus, to meet the living God, giving real witness to their Christian faith. He said he witnessed one of the strongest examples of the Franciscan dedication both to the local Christians and to the holy sites in Syria, which he visited in April. There, two Franciscan friars remained with 300 Christian families in two villages under the rule of the Islamic State group in order to “guarantee Christ’s presence … and the presence of Eucharist and a presence of church” for the families, he said. He added that although these friars were not able to cross over into Aleppo to see him, he did see how other Franciscans there were active in organizing the laity to help themselves. “The Franciscans really serve as a cornerstone for coordinating and implementation and getting the funding in … and also empowering laity to become partners in caring for their own people in Syria, so the laity in Syria, the young people in particular, were involved in this dire service to their own people, and not just to Christians, but to Muslims as well. This was an amazing witness to me,” he said. The 800th year anniversary is one of celebrating the work that God continues to do in the Holy Land, he said.